I am currently looking at a new server. Mine has gotten quite dated and with my new love of virtualizing everything, I want to have enough threads to go around with the amount of machines I want to have. 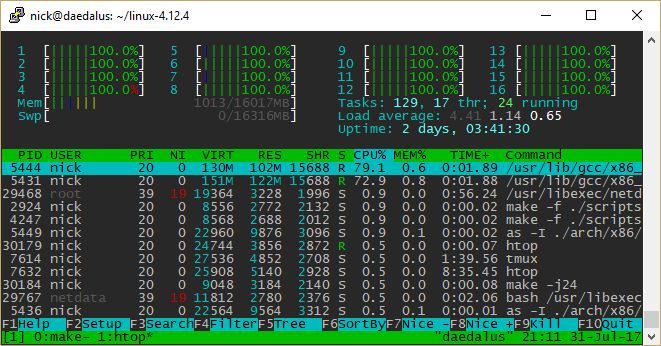 Hosting servers such as ARK: Survival Evolved and others. Just for the sake of not running out. I thought about getting the Ryzen 7 1700 at first due to its 8 cores / 16 threads but didn't like the price tag. I then went to look at a Ryzen 5 1600X and it had decent performance for the price but did not have an included cooler. The Ryzen 5 1600 seems to perform identically to the 1600X when it was clocked to the 3.4Ghz of the 1600X instead of its stock 3.2Ghz. So I think getting the 1600, with the included cooler, would be worth it since I would otherwise spend at least $50 for only .2Ghz of change. Just for reference, here is the comparison between my current CPU, a Phenom, and the prospects, the 1700 and the 1600. I know cpubenchmark.net isn't the best but it is a relative gauge. This requires recycled parts from current server. Current server has a great uptime and I don't want to finally have to shut it down after 560 days. I recently have made a big purchase and do not want to make another, although this is fairly justified given that the server is almost 7 years old. I really want to buy this. I am shooting now for an overclockable chipset along with 2 more cores and 4 more threads for fun. Why go with Bronze on a machine that's meant to stay on 24/7? Does Bronze provide a benefit that would be a reasonable trade off for its inefficiency? That case looks incredibly amazing. The "80+ Bronze" stuff is just an efficiency rating. I honestly don't care about it as much because I'm not paying for electricity. That case is really beautiful, yes. It's the MicroATX version of my desktop case so I'm really looking forward to the combined aesthetic of them. I honestly don't care about it as much because I'm not paying for electricity. It sounds assholey but most 80+ Gold and up PSUs are at least 600W, $70+, and I don't need that considering this server has a 150w tdp. Yeah i was reading how they don't really make Gold or higher for consumer PCs because they are much higher wattages. Do you live near/can get a friend to ship from a microcenter? They have fantastic CPU+Mobo deals. I live within an hour of one of the Atlanta Microcenters. Some of the deals I am seeing are very intriguing. I officially bought the parts. I am going to keep my old server to run services for ORE. This server is for experimentation / running game servers for friends and I.
I am confiscating a friends old Radeon HD 6850 so he and I can use it for neural network tomfoolery. So the server is built and I am very impressed with the performance. The case is rather beautiful and it matches my desktop rather well. Once I finally decide on a distribution for the host OS, I will then fully configure it with a neural network VM, a small VM for game server hosting with friends, and a rather large VM for me to try out RTMP streaming and encode a ~30Mb/s stream from my computer to around ~3Mb/s for Twitch. Neural networks run lots of small calculations to paint a big picture. This CPU has 16 parallel computational units, threads. A GPU like the 6850 has around 1000 parallel computational units, threads. Granted, they aren't nearly as powerful per, but get the job done. A $100 GPU can outperform a $1000 CPU when it comes to neural networks just because of the thread count. The VM will have access to the graphics card with a PCIe passthrough. Thankfully lots of PCIe passthrough bugs with Ryzen have been fixed recently. It would also only need like 1gb of RAM and 1 thread.